So why is it called Grand Canyon? What else could you call it? Is ginormous actually a word? Ginormous Canyon? Humongous Canyon? Neither sounds as elegant. Nor does Most Incredible, Unbelievably Large Canyon in the World, Ridiculously Huge Canyon, You Can’t Imagine How Big it Actually Is Canyon. You get the idea. So Grand Canyon it is. 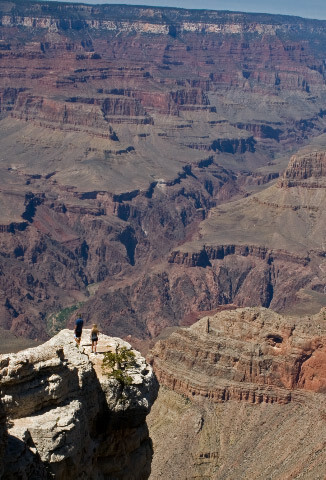 For many, the first glimpse of it is at the Mather Point viewing platform on the southern rim. When you see it, it’s almost too much for your brain to take in. It seems as though a Hollywood director has come in and hung a painted backdrop about 100 metres from the edge, such is the scale of the scene. Thousands cram the the edge to see the view, but the view quickly renders such a crowd insignificant. The canyon is a truly awe-inspiring place, where it is easy to wander and feel a connection of life at this point of the planet many centuries ago, and perhaps many centuries to come. The canyon is about 450km long and up to about 30km wide. 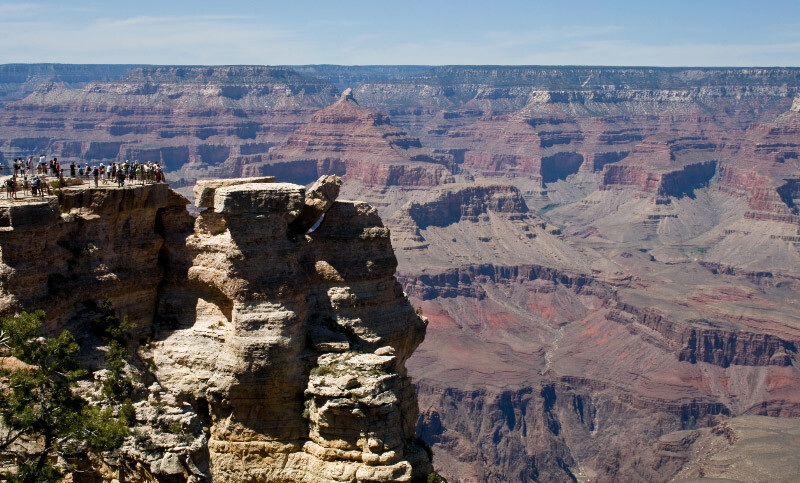 You can view it from the southern rim (the most visited), the northern rim, trek down the side to the Colorado River about 1800 metres below the rim, view it from above via helicopter, or drift through it on a boat along the river. Two sightseers get up close and personal with the Grand Canyon. Picture: Chris Mannolini. It’s all in a national park, of course, Grand Canyon National Park, to be exact. And the southern rim is well organised to deal with the hordes of sightseers from around the world. There are numbered carparks, shuttle buses, restaurants, a couple of hotels, museums, and gift shops. Entry fees to the park include a handy map detailing areas such as Hopi Point, Mohave Point, and The Abyss. I was looking forward to taking pictures at sunset, and caught the shuttle bus to Monument Creek Vista and walked west towards Pima Point. I was mesmorised by a couple of eagles soaring over and swooping down towards some intended prey, although didn’t see any kill. As the light dimmed, it was amazing how quiet the vast canyon became. It was easy to find a deserted part of trail and simply stare and listen to the silence. Approaching sunset, many had “baggsed” the best spots on the viewing platforms, their cameras hooked up to the rails or on tripods. But the sunset was a disappointment. The light simply disappeared and, of course, the canyon valley simply got dark and darker until it was black. With te sun having set, there was a rush for the shuttle buses and it was standing room only on the trip back to the carparks. This was the second time I had seen the Grand Canyon. It doesn’t matter how many times you see the place, it is as grand a canyon as there is. You can see more of my photos of the Grand Canyon at my Flickr site here. Is the Grand Canyon the most amazing thing you’ve seen? Have you actually seen a great sunset at the canyon? I’d love to read your thoughts.